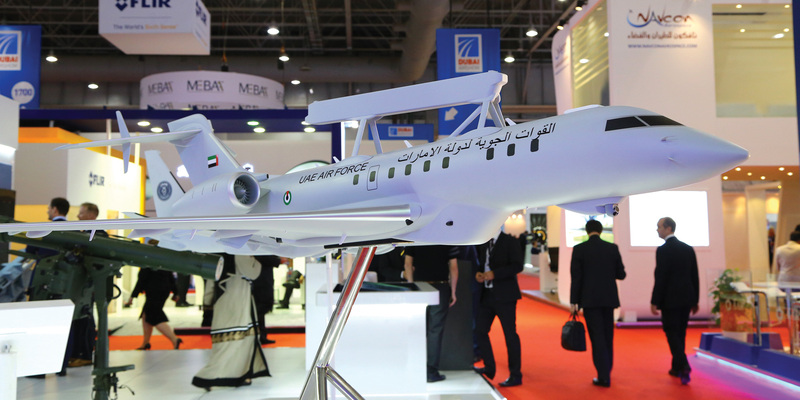 Saab’s AEW solution for the UAE marries a Global 6000 airframe with the latest sophisticated radar and electronic warfare gear. A number of airframe platforms have carried previous generations of the Erieye radar, including the Metroliner, Saab 340 and 2000, and the Embraer EMB-145. The Global 6000 provides increased endurance, greater capacity for more sensors, and the potential to reach much higher patrol orbits. In standard business jet form the Global 6000 has a service ceiling of 51,000 feet. While the UAE is the lead customer for the latest iteration of the Erieye concept, the developments being undertaken will feed into the overall program, and will become available for other customers. Whether gallium nitride (GaN) semi-conductor technology is employed in the SRSS–as used in Saab’s recently launched Giraffe family of ground-based radars–has not been disclosed, but it is likely that there are at least some GaN elements.